For some reason, toads get a bit of a hard time when compared with frogs and yet they are just as important and many people aren’t sure what the difference between the two actually is. Here are some interesting facts and useful links to help you better understand the fascinating toad, thanks to Aunty Jane! At this time of year when we start to take more interest in our “outdoor room” aka the garden, it’s not uncommon to unearth unexpected residents who we share this space with. 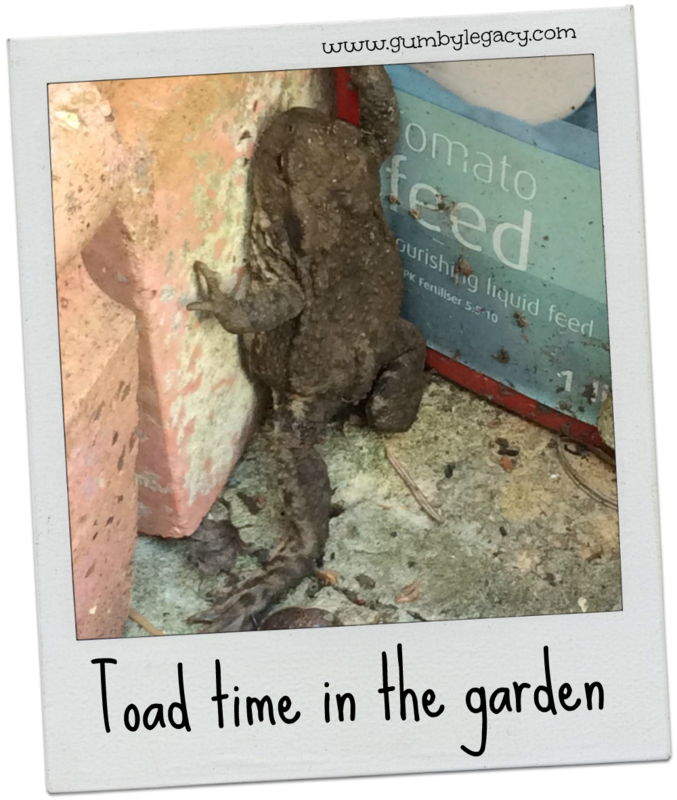 My good friend Karen sent me a photograph of this magnificent toad which she discovered in her garden while she was moving things about. We are lucky enough to have toads in our small suburban pond and in early Spring the pond turns into a heaving mass of reproductive activity, sometimes referred to as “knots”. Interestingly, toads apparently always return to their original home but avoid interbreeding by recognising unique calls that identify kith and kin. Toads are not the same as frogs, although they are part of the same genus: anurans. These amphibians have been on the planet a lot longer than man: a staggering 150 million years! There are 2,000 different species of toad in the world (coming in at slightly less than their Frog cousins). The largest toad in the World is the Cane toad (Bufo marinus): the largest individual weighed 2.65 kg (5.8 lb) with a body length of 38 cm (15 in). The easiest way to tell the difference between frogs and toads, is by their drier and lumpy skin – while these are often referred to as warts they have nothing to do with the viral infection which can afflict us and contrary to popular myth of my childhood, you will not get warts if you handle toads! Having said that, handling any wild creature should only be done if absolutely necessary by someone who knows how to handle them properly… This helpful website is a good introduction to the different characteristics of frogs and toads. Encouraging children to take an interest in the natural world around us is always a good thing and in particular when creatures might not necessarily always be visually appealing. This helpful little guide from Nottinghamshire Wildlife Trust makes a good introduction for novices of all ages. A hearty savoury dish, having a bit of resurgence in Gastro pubs at the moment involving sausages submerged in batter is known as Toad in the hole (no toads involved),the legend being that the sausages peeking about resembled toads poking their heads out of holes! If you are fortunate enough to be blessed by toads or have any interesting stories or facts to share, we’d love to hear from you.